Jaras Invel is an Imperial acrobat, and a guest of Countess Alessia Caro, along with his wife Britta. 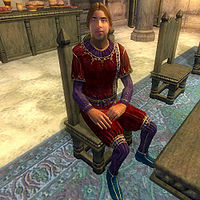 He can only be found during Sanguine's quest; he is dining with a few others when their clothes are removed by the Stark Reality spell for Sanguine's entertainment. After a short period of panic, he resumes his meal sans clothing. Jaras wears an upper class outfit consisting of red velvet blouse with red velvet garments and a pair of blue suede shoes. He also carries a bread loaf, an apple and some gold.